His Holiness Drikung Kyabgon Chetsang Rinpoche demonstrates the 9-round yogic breathing. This is a cleansing technique often performed prior to meditation. It is part of the Six Yogas of Naropa. His Eminence Garchen Rinpoche performs the 8 offering mudras during a White Tara practice in Moscow. Khenpo Tsultrim Tenzin Rinpoche's teachings at the RigDzin Dharma Center. Here, he discusses Mahamudra meditation. Click HERE, or on the picture at left, to hear Dr. Hun Lye's wonderful dharma talks via podcast. 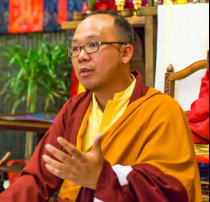 "Dr. Hun Y. Lye, founder of Urban Dharma in Asheville, North Carolina, has been given the title and position of Dorjé Lopön (Vajra Master) by His Holiness Drikung Kyabgön Chetsang Rinpoché, the leader of the Drikung Kagyü lineage of Tibetan Buddhism. This is the first time a lay teacher in the West has been given the title of Vajra Master. His Holiness the Drikung Kyabgön gave Lye this title in recognition of his extensive studies and years of practice of Buddhism. Furthermore, this title formalizes his responsibility for passing on Drikung Kagyü teachings and transmissions that he has properly received and practiced." When you get to the podcast site, look to the left and click on "view it in iTunes" and the active podcasts will come up for you to download if you wish. You can listen to it directly to the podcasts on the website by double clicking on the podcast itself. You don't have to download it. Ven. Traga Rinpoche and the RigDzin Sangha during Lama Chopa practice. Toward the end, Rinpoche performs the 8 offering mudras. A wonderful opportunity to learn these mudras! Khenpo Tsultrim Tenzin Rinpoche's teachings at the RigDzin Dharma Center. Here, he discusses the meaning of smoke offering. These wonderful talks are on YouTube, but they are audio only. Click on the picture at left, or HERE, to visit this link.